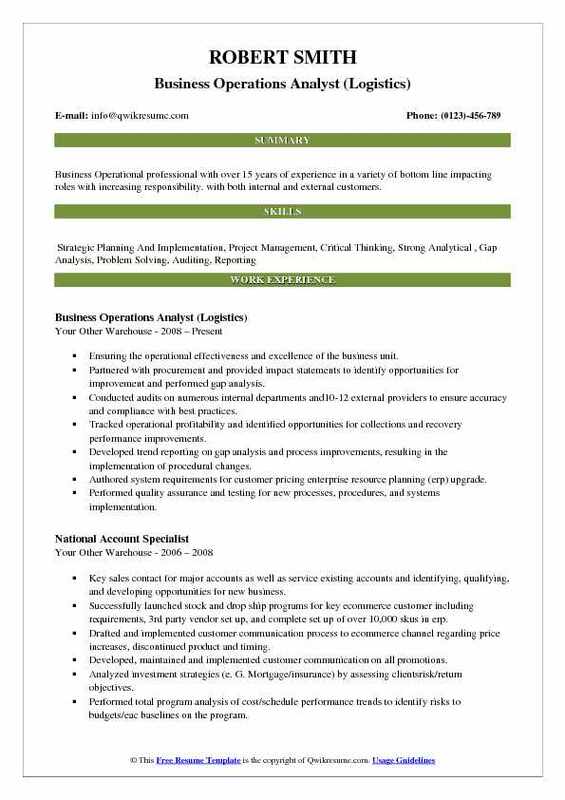 Business Operations Analyst Resume is responsible to determine, evaluate and report operational metrics of a business to meet ongoing information needs. Typical job description for a Business operations analyst role involves their contribution like working closely with the client support team manager and operation services and ensuring data reporting and integration. Business Operations Analyst responsibilities are to identify the business operational irregularities and ensure that the company complies with the stipulated rules, standards and regulations. 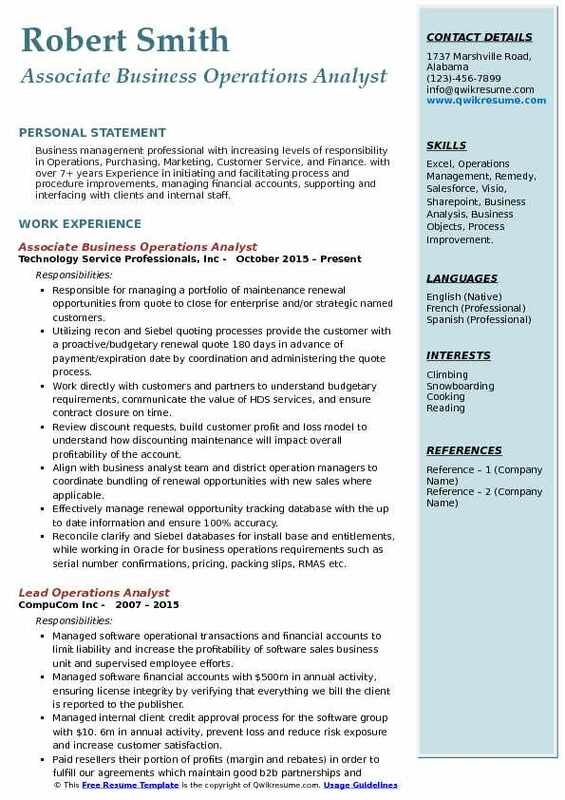 An ideal candidate possessing a Graduation in any of the subjects like Business Management, Commerce, and Statistics, IT or Economics can fit into the role of a Business Operations Analyst, the candidate has to demonstrate intrinsic computer skills and detail oriented ability to shine in this career. 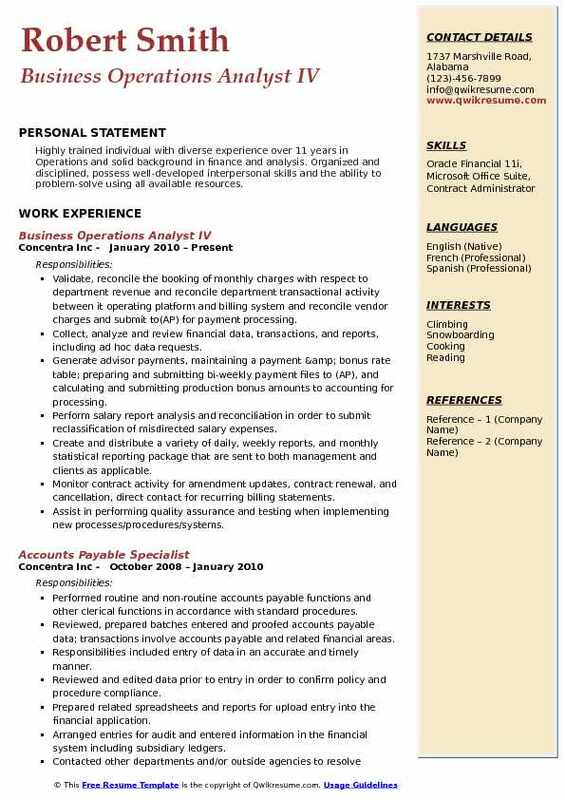 Objective : Seeking a professional position that will provide a challenging role utilizing my current experience while allowing me to gain more knowledge as Business Operation analyst. Provide support as a point of contact for ECM and on point issues for agents, TL and SMEs and develop communication tools to support these systems in an effort to provide transparency to all users. Developed a strong network throughout the organization along with working relationships with vendors such as DST. Ability to recognize vendor batch IDs to ensure that all data is accurately uploaded in a timely manner. Follow-up on requests from vendors such as JPMorgan regarding any payment discrepancies on customer accounts. Facilitate daily onboarding / offboarding requests from managers through CISM ticket requests. Compile daily and monthly ACH returns reports for distribution to stakeholders and maintains team on call, business and system hour communications. Supporting western union/online pay and JPMorgan auto pay - pull daily and monthly reports and distribute to stakeholders. 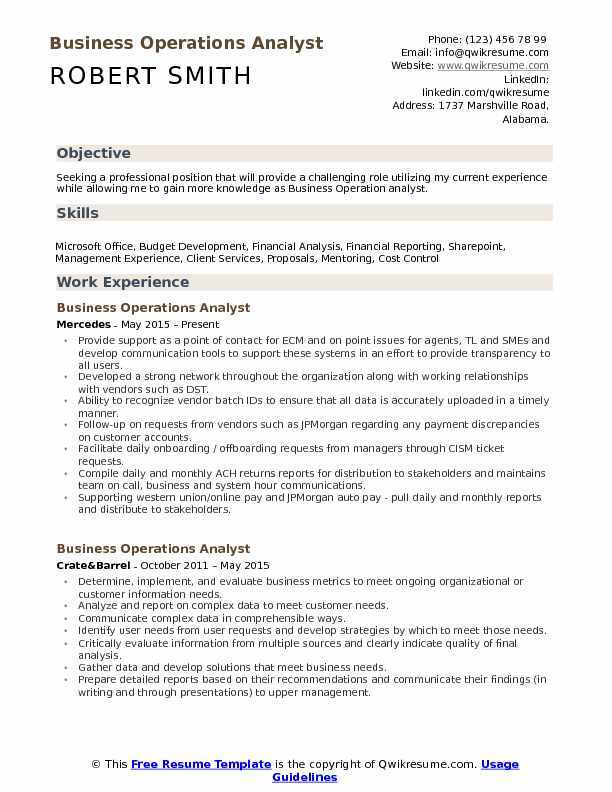 Summary : Highly motivated Business Operations Analyst, who thrives in high-pressure environments. Excellent financial reporting, budget forecasting, management and team-building skills. Skills : SQL, PL/SQL, C, C++ Database Systems Oracle 8i, Oracle 9i, Oracle 10g, Oracle 11g, Microsoft Access, Microsoft SQL Server, And DB 2. Responsible for gathering pertinent customer data, generating metrics, analyzing business processes and customer activity monitoring, as part of operations review. Helped, investigate sign-in button issue where customers were unable to access their online profile. Derived metrics from customer feedback/comment data to support the investigation. Analyzed, maintained and presented login metric reports for login irregularities, estimated lost volume data and trends. Additionally facilitated the reports for the assigned l3 support team for further analysis. Monitored multi-lob customer login exception reports the company login metrics were within expected SLA. Assisted in developing metrics to identify performance degradation during CIC to senior management. Developed Splunk dashboards that display metrics for customers that successfully collapsed via mobile/web channels. Contributed to the development of reverse engineering methods in remediating customers that encountered a failure during a collapse. Spearheaded validations on multiple channels for single sign on and identified gaps/defects by comparing the intent design, system design, and production results. 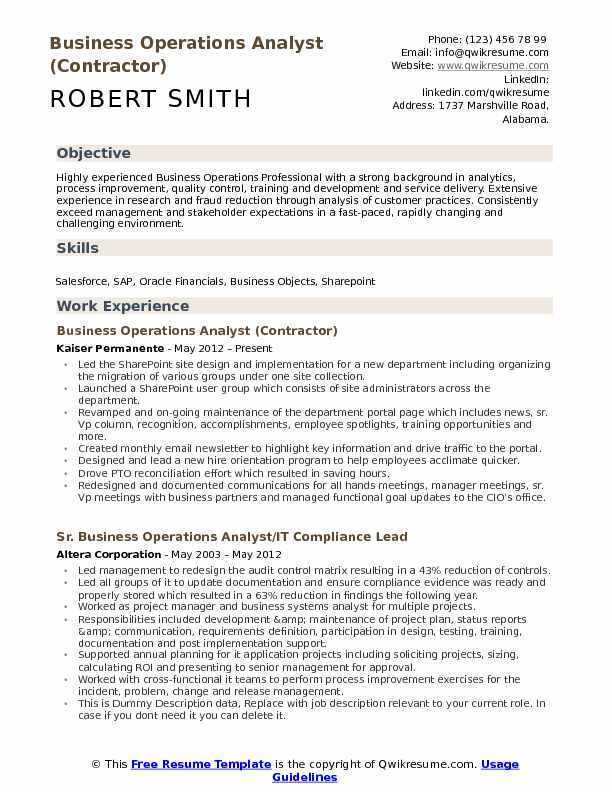 Summary : A results oriented Business Operation Analyst professional with over 10 +years of experience in the areas of information technology, procurement, supply chain, and operations. Excellent cross organization and cross functional skills. Performed month end and quarter end financial close processes. Provided financial counsel to brand directors. Stretch assignment to provide consulting to central marketing operations team (mot) on vendor management initiatives. Provided data analysis support for cost savings opportunities. Implemented 30% cost savings for GCMB that included long tail analysis, supplier consolidation, and contractor agency consolidation. Worked closely with the diverse business team to ensure 100% diversity and compliance rules were met. Created supplier scorecard program which resulted in the program being the benchmark and best practice that procurement refers to when working with other teams. Collaborated with more than 6 service category owners to develop engagement guidelines which were posted in the preferred supplier portal. Resolved invoicing issues with three major social media suppliers. Spent 5 months working with one vendor by providing invoicing and payment information. 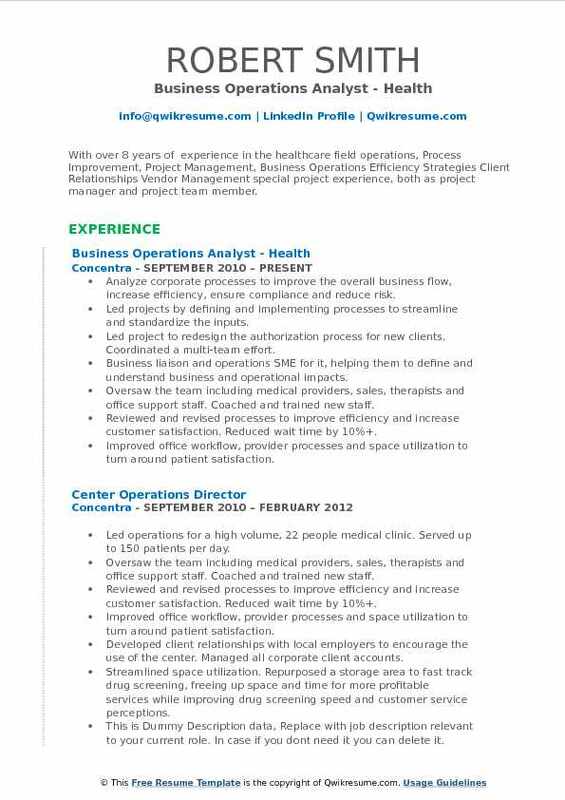 Headline : With over 8 years of experience in the healthcare field operations, Process Improvement, Project Management, Business Operations Efficiency Strategies Client Relationships Vendor Management special project experience, both as project manager and project team member. Skills : Business Analysis , Implementation , Project Management , Quality Management , Documentation , Training Delivery , ERP , Program Management,HIPAA Medical Office Procedures, Strong Customer Service Focus. Analyze corporate processes to improve the overall business flow, increase efficiency, ensure compliance and reduce risk. Led projects by defining and implementing processes to streamline and standardize the inputs. Led project to redesign the authorization process for new clients. Coordinated a multi-team effort. Business liaison and operations SME for it, helping them to define and understand business and operational impacts. Oversaw the team including medical providers, sales, therapists and office support staff. Coached and trained new staff. Reviewed and revised processes to improve efficiency and increase customer satisfaction. Reduced wait time by 10%+. Improved office workflow, provider processes and space utilization to turn around patient satisfaction. Streamlined space utilization. Repurposed a storage area to fast track drug screening, freeing up space and time for more profitable services while improving drug screening speed and customer service perceptions. 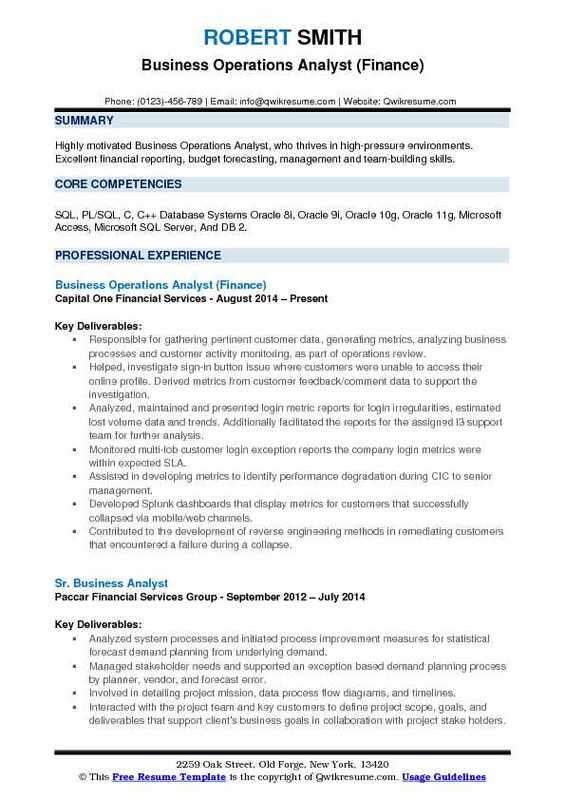 Headline : Dedicated professional with over 5 years of business analyst/support experience, innovative management techniques to successfully lead teams to peak performance, cut costs, streamline operations and increase productivity while working under pressure in fast paced environments to meet critical deadlines. Directed major renovation of Patuxent river business office to include new IT infrastructure and functionality of the facility . Coordinate across a deployed team worldwide to develop the agenda and sequence of events for the strategy offsite sessions of bell helicopter domestic and international business development. Develop data management processes that includes sharepoint, box and other data storage medium. Coordinate with the campaign leads to develop weekly reports to the executive leadership team. Organize logistics and scheduling of key visitors to the geographically separated aviation facilities. Manage and track generated special check requests for payments of tradeshows, consultant fees, sponsorships, donations, and corporate memberships through accounts payable system. Monitor and manage departmental equipment distribution to include cellphone, tablet, and supporting peripherals. 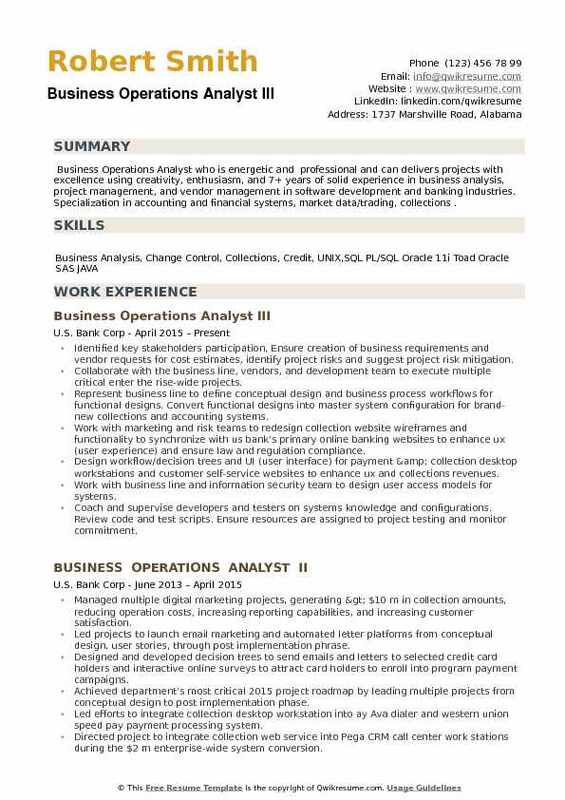 Summary : Experienced Professional Business Operations Analyst within the Contract and Compliance Administration of a Fortune 500 Company for the past 18 years. Achievement-driven, with a history of producing accurate and timely results. Analyze the monthly, quarterly and annual sales performance of 300 contracts against the contractual commitments for several business units. Analyze and provide recommendations on business issues and opportunities. Design and develop reporting and analysis for sales professionals, managers and directors. Create and/or contribute to the creation and maintenance of standard operating procedures. Assist in the development of information systems with the IT group for sales/business analysis and trends. Analyze pricing analysis to ensure pricing guidelines are maintained to quantify the impact that proposed pricing would have on sales and profit. Prepare profitability analyses to assess the profitability of proposed contracts and ensure that business strategies are achieved. Present to various groups on profit analysis processes, guidelines and results. Summary : Proactive, highly skilled professional with eleven years' experience working in both the private and public sectors. Extensive and diverse experience in customer service, analysis, reporting, collections, reconciliation, cash application, billing and payable. 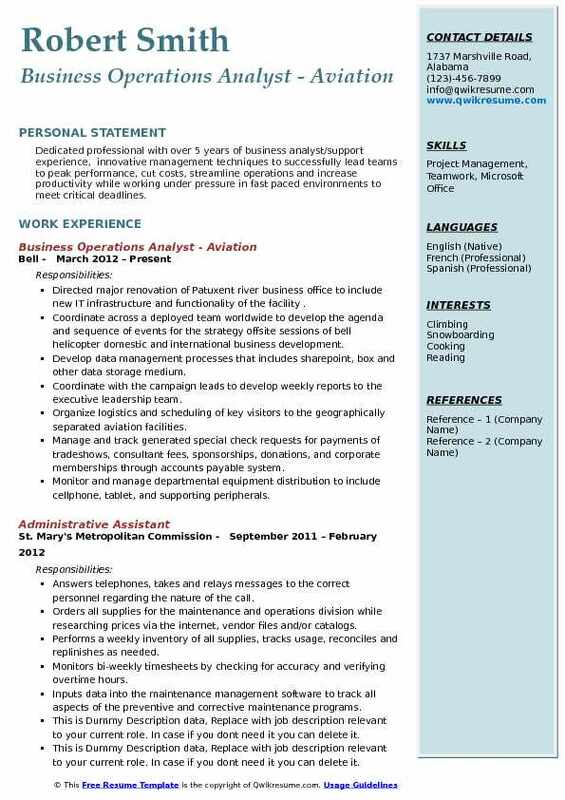 Skills : Microsoft Excel, Quick Books, Oracle, Great Plains, JD Edwards. In charge of analyzing billing data and generating monthly invoices using a variety of different billing methods. Responsible for journal entries, generating aging reports, and partner specific financial reporting. Implementing an online bill payment portal, streamlining billing processes company wide, etc. In charge of billable expenses for costs incurred which are eligible to be billed back to the partner. Contract interpretation, updating pricing, managing relationships with our partners and supervising an employee. Responsible for the collections, processing, and balancing of monetary deposits. Cash application, issuing refunds, auditing bank accounts and GL accounts are large parts of this position. Attention to detail, scheduling, follow up and record keeping is important to this role. Summary : Experienced Business Operations professional with more than 9+ years in Information Technology and Services.Demonstrated ability to leverage Operations functions for teams in fast-paced, rapidly changing organizations. Skills : SAP-OM (data entry and reporting), Ariba People Soft, MS-Excel, MS-Word, MS-PowerPoint ,MS-Outlook ,SharePoint ASU 400 Bluebird Imaging Software. Liaison for US procurement within a global network in global procurement support. Represented various client and vendor meetings to ensure client expectations and deliverables have been met. Coordinate the creation of suppliers to be set up for purchasing and payments in SAP. Responsible for monthly audit of suppliers to ensure they are in compliance in SAP. Identify and implement processes to improve operations support based on the business needs of Accenture. Developed processes to increase operational efficiencies streamlined. Created ad-hoc queries to assist senior management in their decision making. 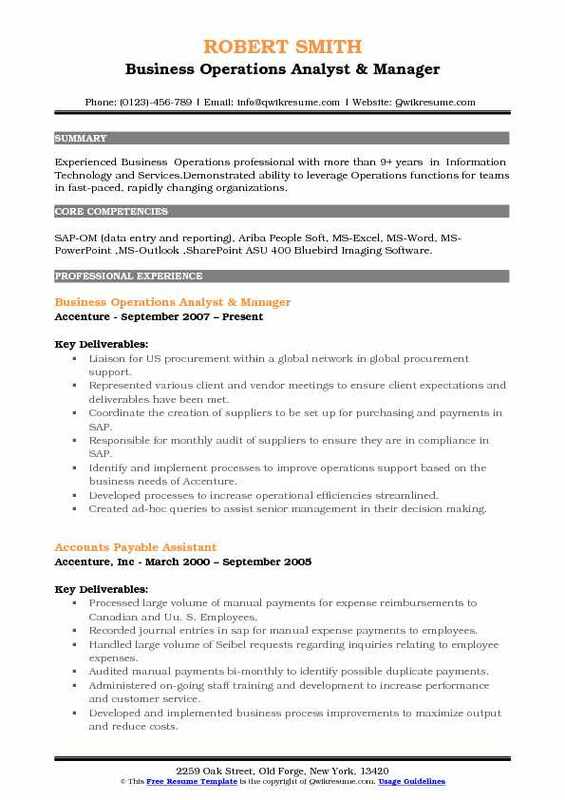 Summary : Highly trained individual with diverse experience over 11 years in Operations and solid background in finance and analysis. Organized and disciplined, possess well-developed interpersonal skills and the ability to problem-solve using all available resources. Validate, reconcile the booking of monthly charges with respect to department revenue and reconcile department transactional activity between it operating platform and billing system and reconcile vendor charges and submit to(AP) for payment processing. Collect, analyze and review financial data, transactions, and reports, including ad hoc data requests. Generate advisor payments, maintaining a payment & bonus rate table; preparing and submitting bi-weekly payment files to (AP), and calculating and submitting production bonus amounts to accounting for processing. Perform salary report analysis and reconciliation in order to submit reclassification of misdirected salary expenses. Create and distribute a variety of daily, weekly reports, and monthly statistical reporting package that are sent to both management and clients as applicable. Monitor contract activity for amendment updates, contract renewal, and cancellation, direct contact for recurring billing statements. Assist in performing quality assurance and testing when implementing new processes/procedures/systems. 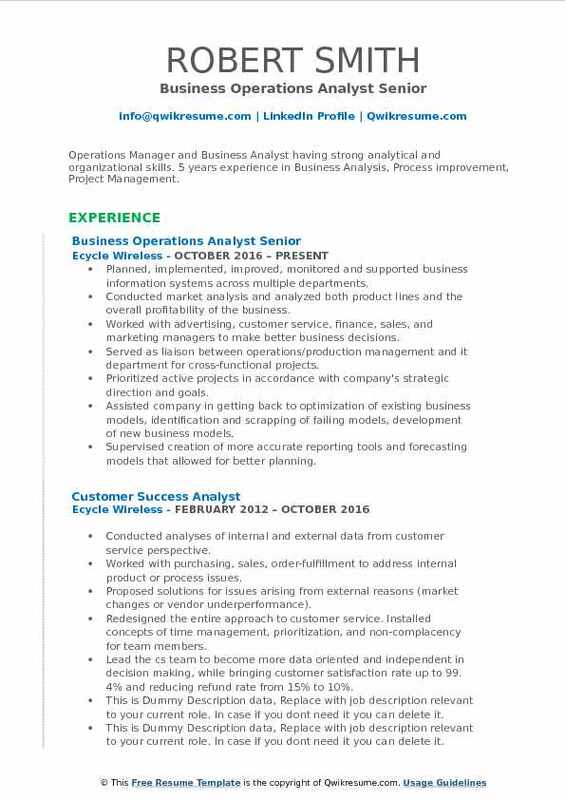 Summary : Business Operations Analyst who is energetic and professional and can delivers projects with excellence using creativity, enthusiasm, and 7+ years of solid experience in business analysis, project management, and vendor management in software development and banking industries. Specialization in accounting and financial systems, market data/trading, collections . Identified key stakeholders participation, Ensure creation of business requirements and vendor requests for cost estimates, identify project risks and suggest project risk mitigation. Collaborate with the business line, vendors, and development team to execute multiple critical enter the rise-wide projects. Represent business line to define conceptual design and business process workflows for functional designs. Convert functional designs into master system configuration for brand-new collections and accounting systems. Work with marketing and risk teams to redesign collection website wireframes and functionality to synchronize with us bank's primary online banking websites to enhance ux (user experience) and ensure law and regulation compliance. Design workflow/decision trees and UI (user interface) for payment & collection desktop workstations and customer self-service websites to enhance ux and collections revenues. Work with business line and information security team to design user access models for systems. Coach and supervise developers and testers on systems knowledge and configurations. Review code and test scripts. Ensure resources are assigned to project testing and monitor commitment. Over-sight software development, project delivery, and success of all aspects, including it delivery, end user training, and audit materials. Summary : Highly experienced Business Operations Professional with a strong background in analytics, process improvement, quality control, training and development and service delivery. Extensive experience in research and fraud reduction through analysis of customer practices. Consistently exceed management and stakeholder expectations in a fast-paced, rapidly changing and challenging environment. Led the SharePoint site design and implementation for a new department including organizing the migration of various groups under one site collection. Launched a SharePoint user group which consists of site administrators across the department. Revamped and on-going maintenance of the department portal page which includes news, sr. Vp column, recognition, accomplishments, employee spotlights, training opportunities and more. Created monthly email newsletter to highlight key information and drive traffic to the portal. Designed and lead a new hire orientation program to help employees acclimate quicker. Drove PTO reconciliation effort which resulted in saving hours. Redesigned and documented communications for all hands meetings, manager meetings, sr. Vp meetings with business partners and managed functional goal updates to the CIO's office. 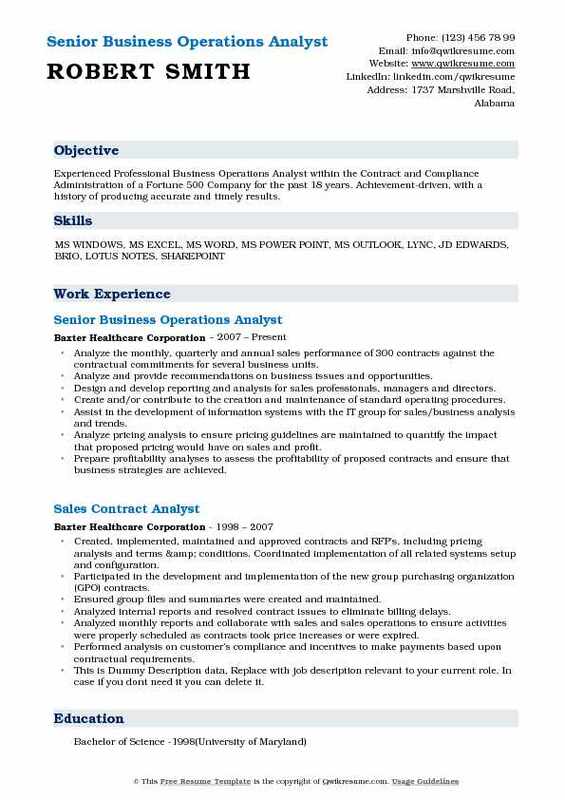 Headline : A flexible and resourceful professional with proven analytical skills and 4+Years experience in healthcare industries. Thrives in a multi- tasking and dynamic environment. Implemented cloud based VOIP telephony including administrator UI capabilities. Managed all vendor relationships toward improved SLAs and reducing expense. Implemented consumer facing, online pharmacy and veterinary products, e-commerce website. Implemented cloud based patient management repository tool for existing clients. Developed and implemented turnkey proprietary customer loyalty application for the owner. Revised all inventory management processes to reduce obsolescence and overstock. Managed all IT infrastructure, systems applications, and business intelligence (BI). 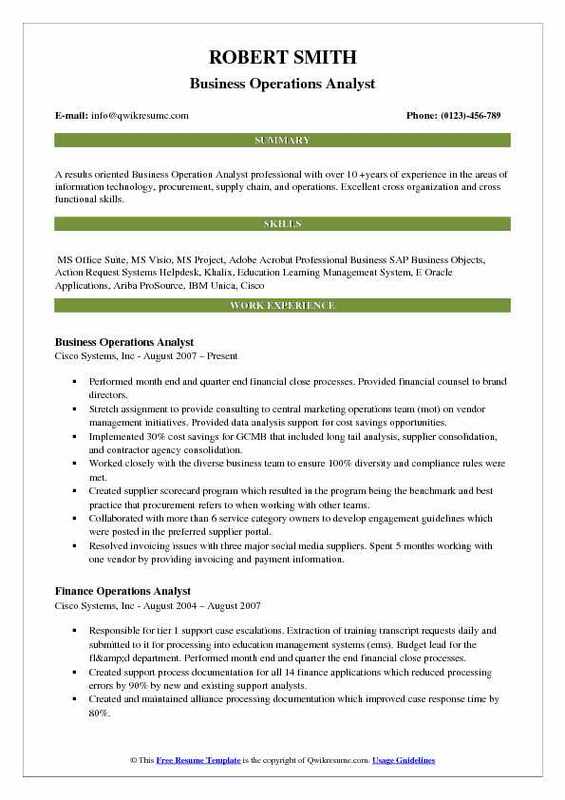 Summary : Business Operational professional with over 15 years of experience in a variety of bottom line impacting roles with increasing responsibility. with both internal and external customers. Ensuring the operational effectiveness and excellence of the business unit. Partnered with procurement and provided impact statements to identify opportunities for improvement and performed gap analysis. Conducted audits on numerous internal departments and10-12 external providers to ensure accuracy and compliance with best practices. Tracked operational profitability and identified opportunities for collections and recovery performance improvements. Developed trend reporting on gap analysis and process improvements, resulting in the implementation of procedural changes. Authored system requirements for customer pricing enterprise resource planning (erp) upgrade. Performed quality assurance and testing for new processes, procedures, and systems implementation. 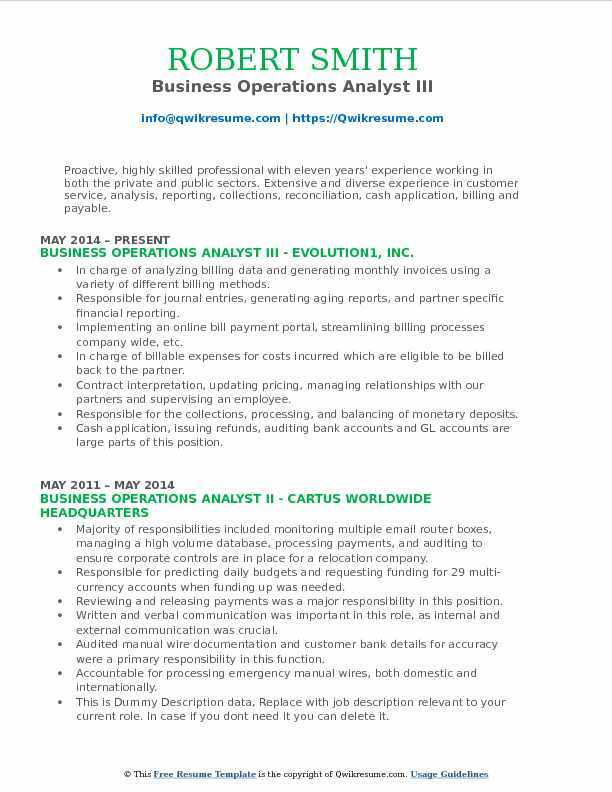 Headline : Operations Manager and Business Analyst having strong analytical and organizational skills. 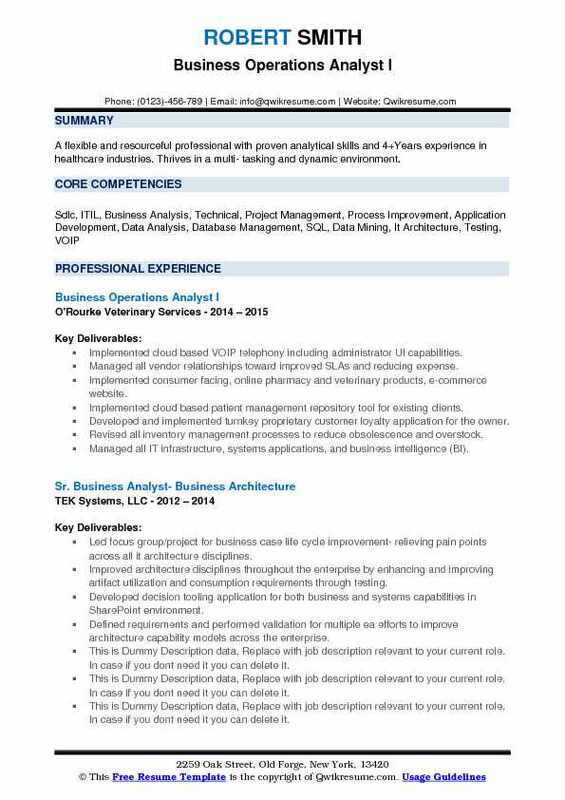 5 years experience in Business Analysis, Process improvement, Project Management. Planned, implemented, improved, monitored and supported business information systems across multiple departments. Conducted market analysis and analyzed both product lines and the overall profitability of the business. Worked with advertising, customer service, finance, sales, and marketing managers to make better business decisions. Served as liaison between operations/production management and it department for cross-functional projects. Prioritized active projects in accordance with company's strategic direction and goals. Assisted company in getting back to optimization of existing business models, identification and scrapping of failing models, development of new business models. Supervised creation of more accurate reporting tools and forecasting models that allowed for better planning. Headline : Business management professional with increasing levels of responsibility in Operations, Purchasing, Marketing, Customer Service, and Finance. with over 7+ years Experience in initiating and facilitating process and procedure improvements, managing financial accounts, supporting and interfacing with clients and internal staff. Skills : Excel, Operations Management, Remedy, Salesforce, Visio, Sharepoint, Business Analysis, Business Objects, Process Improvement. Responsible for managing a portfolio of maintenance renewal opportunities from quote to close for enterprise and/or strategic named customers. Utilizing recon and Siebel quoting processes provide the customer with a proactive/budgetary renewal quote 180 days in advance of payment/expiration date by coordination and administering the quote process. Work directly with customers and partners to understand budgetary requirements, communicate the value of HDS services, and ensure contract closure on time. Review discount requests, build customer profit and loss model to understand how discounting maintenance will impact overall profitability of the account. Align with business analyst team and district operation managers to coordinate bundling of renewal opportunities with new sales where applicable. Effectively manage renewal opportunity tracking database with the up to date information and ensure 100% accuracy. Reconcile clarify and Siebel databases for install base and entitlements, while working in Oracle for business operations requirements such as serial number confirmations, pricing, packing slips, RMAS etc. Provided management with data improvements that would create efficient data input thus reducing overall issues created by bad data.